This lesson summary page is open to the public. The Team's lessons themselves are only open to Supporting Members who make this site possible! Become a Supporting Member today! A special "Emmaus Stations" Workshop ...traveling through a number of interactive demonstrations. A fun Music Workshop that uses rhythm techniques in every step of the lesson. An Art Workshop that includes some terrific painting tips, artwork to share, and links to background music keyed to the story. Part of the aim of the Writing Team is to expand our sense of "what's possible" in each workshop, adding to our bag of creative techniques which can then be used with other lessons as well. The Bible Background doc is open to the public. It provides teachers with important and fresh insights into this story they can directly share in the classroom. A story painting activity with many creative options and a packet of artwork to share. 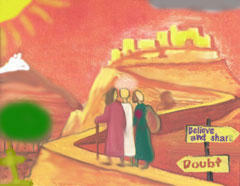 Includes a list of contemporary Christian songs to play in the background that speak to something in the Emmaus story. An interactive program that retells the story in a fun way and includes an onscreen reflection activity. The lesson has notes to adapt it for those who have just one computer and are projecting the software or showing it on a large monitor. Students travel between stations that include two experiments, a puzzle to assemble, a "bread box" reflection, and a "dominoes" demonstration. Every step, from Welcome to Closing, is presented using a rhythm technique any semi-musically-inclined teacher can lead. The main activity is an Emmaus Rhythm Rap provided on a handout and included in two audio clips for the teacher. Lots of presentation tips for a wide age range. After completing a special hunt, teams use their finds to retell the story. Includes a fun visual guessing game to start the lesson, and a "personal scavenger hunt" closing. Students view a short video clip of the story, then produce their own version of the music video "I Can Only Imagine" with some simple but powerful drama techniques. We've picked a neat video clip for this lesson that has a unique twist in it! It's also free available to preview. A list of some of the extra special content found in the workshop lessons which could be pulled out and used in other ways.